The presence or absence of compound eyes in adult aphids can help identify species. 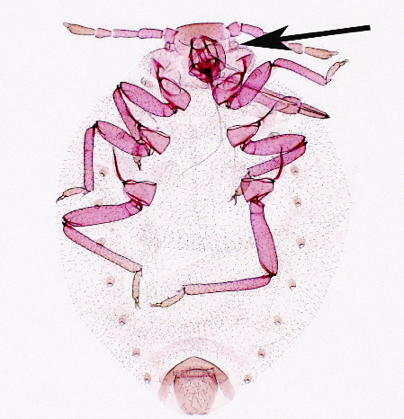 Most adult aphids have a pair of conspicuous compound eyes. Most alatae also have three ocelli arrayed in a broad triangle on the dorsal aspect of the head. A triommatidium is often associated with the compound eye, located on an ocular tubercle on the posterior margin of the compound eye. 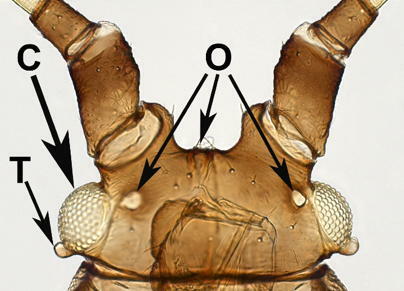 The left compound eye is labeled C, the left triommatidium on an ocular tubercle is labled T, and all three ocelli are labeled O. The normal compound eyes are absent on this adult. Only the triommatidia remain (arrow). The ocelli are also absent. 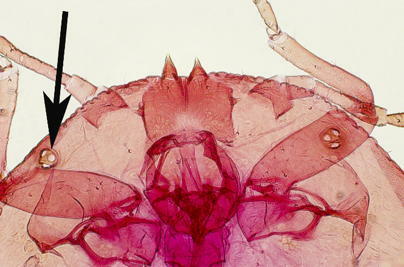 Compound eyes reduced to just the triommatidium, here still present on an ocular tubercle.